nverclyde Council plans to build a new £15 million (US$19.4 million) berthing facility and visitor centre at Greenock Ocean Terminal in Inverclyde, Scotland. 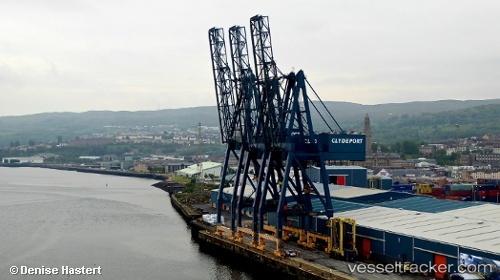 To be funded by the Glasgow City Region Deal, the new berthing facility will boost Greenock’s capacity to handle cruise ships and enable operator Peel Ports to handle more than 150,000 cruise passengers per year. Forecasts suggest that this could generate an additional £26 million in annual revenue for the Scottish economy. Scotland’s deepest container terminal last week welcomed the largest container vessel ever to berth at the port. Greenock Ocean Terminal hosted the 267m MSC POHORJE, which has a capacity of 4,045 TEUs (twenty foot equivalent units), for 28 hours. The stopover saw the Clydeport team load 500 TEUs of Scottish spirits destined for Le Havre, France. Andrew Hemphill, Port Director, Peel Ports Clydeport said: “This is a fine example of how our connections with Liverpool are adding real value to our customers who are experiencing an increase in export demand. “The new deep-water Liverpool2 container terminal is opening up a lot of exciting options for importers and exporters. As part of the Peel Ports Group we’re ideally placed to offer those benefits to businesses in Scotland. Scotland’s deepest container terminal, Greenock Ocean Terminal, expects to double its business in the next five years thanks to the opening of GBP 400 million (USD 495.6 million) ‘sister’ terminal – Liverpool2, according to Peel Ports. Clydeport’s Greenock Ocean Terminal has projected that it will handle 200,000 TEU containers a year by 2021.